From a real estate investment perspective, the best bathroom design trends are contemporary yet timeless. To successfully market new homes, modern home builders install bathroom features that will never go out of style, often with a nod to the modern mode of design. The modern sensibility—clean lines, the use of natural materials, and an avoidance of visual clutter—is ideal for bathrooms. Plus, the classically appealing modern approach is unlikely to displease future buyers. Let’s take a look at five modern design trends that can create perpetually appealing bathroom spaces. Modern designers love to include built-ins such as shelves and ledges. And tomorrow’s homebuyers will doubtless need areas to store their bathroom accoutrements, so built-in storage is a good investment for the future. Consider adding storage areas around the mirror, above the bath, or at the top of the room if you have high ceilings. 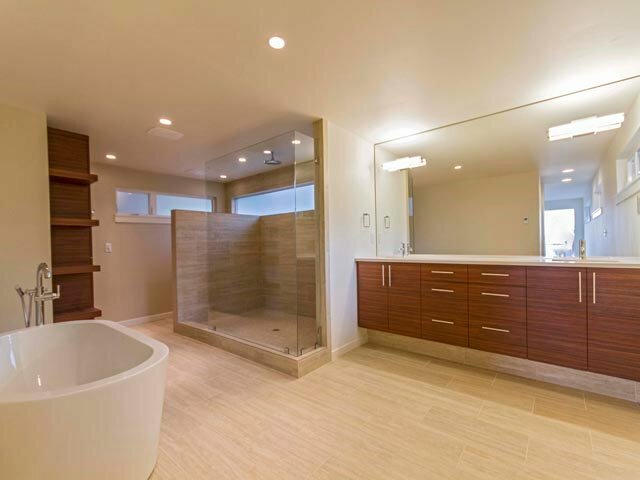 Contemporary bathroom lighting options include recessed lighting and spot lighting to highlight favorite features. For a touch of glamour, some home builders are adding miniature bathroom chandeliers—the crystal reflects light to lend spaciousness. Solar tubes are another great option—they add natural light without adding to the electric bill. 3. Choose a White Color Scheme. White will never go out of style; it’s perfect for bathrooms because it creates a clean, airy feel. Homeowners crave private spa-like spaces where they can de-stress—that’s not likely to change any time soon. The tub is the perfect place to let go at the end of a long day. Fashionable tubs may be rectangular, placed as a focal point in the center of the room, or overlooking a stunning view. Whatever tub option you select, it’s best to make sure you also have a walk-in shower option if possible, for the best age-in-place arrangement. Let’s face it: our addiction to digital entertainment is here to stay. Modern new home builders are placing flat-screen TVs in bathrooms, often where they can be seen from the tub. Integrated music systems with sleek speakers are also trendy now, and likely to remain popular going forward. With one eye on the contemporary design world and another on how tomorrow’s buyers might see today’s bathroom fads, it is possible to select features that will look contemporary, and remain alluring for future generations of homebuyers. We invite you to take a look at some of our upcoming homes to get inspired.